I cant see this Reverb having same SDE as 8K. The Pimax 4K has less SDE than the 8K and 5K+. The Pimax 4K is 1920 X 2160 and the Reverb is 2160 X 2160 with slightly more FOV so it should be on par with the Pimax 4K. So technically and only technically speaking, the Reverb “should” have better SDE than the 8K. Im not sure where VooDoo is getting this?? But then again he’s seeing it with actual “eyes on”. Maybe Voodoo is confusing Mura with SDE. Pimax 4K is 1920 X 2160 and the Reverb is 2160 X 2160 with slightly more FOV so it should be on par with the Pimax 4K. Technically, yes, the eye resolution is about the same, although the HP Reverb is even slightly superior to the P4K. But the claimed wider FOV for HP (114 degrees) most likely levels this slight advantage. But. There is one interesting nuance. The Pimax 4K has a native resolution of 2560x1440 (or 1280x1440 per eye) or, while the HP Reverb has a native resolution of 4320x2160 in both eyes (or 2160x2160 per eye) without any scaling. Definitely, HP Reverb should be the most clear headset without SDE, if the stated characteristics correspond to reality. I find this an intruiging idea - how simple is the process, and most importantly, is it a one time effort or would it require repetition every time you start SteamVR (or even worse, a game) anew ? And would it become more complicated if one had both the 5k+/8K and a Reverb and wished to switch between the two ? Can anybody in brief describe the effort, and whether this is finicky or should just work as long as one follows the procedure ? Built with Analogix new flex scaler 4k bridge chips might have been able to be king supporting upscaling & native. So the HP Reverb is using 1 1.3 displayport to drive 2 2,160 × 2,160 displays at 90 hz. I do not think dp 1.3 has enought bandwidth to do that. I wonder if they are using an upscaler. VoodooDE did a short impression. The SDE comparible with the 8k at first glance, i expected the ppi to be higher on the HP. Interesting video. The total lack of IPD hardware adjustment makes me think that they’re using a single 4k panel, just like the original Pimax 4k had. The downside of course is not only that this might cause eye strain (we’ll have to see about that) but also that they’re giving up at least 1.6 cm of the panel for the software IPD adjustment, so that’s going to cost sharpness and increase somewhat the SDE. Also the tracking probably will be suboptimal like voodoo points out. So not sure yet what to think of this HMD. I guess we’ll learn more soon enough, with the HMD hitting the shops hopefully within a month. The SDE should be definitly better, the 8k have 60,58k Pixel / 1° FOV, HP have 81,85k Pixel / 1° FOV. Can’t wait to buy this HMD, realy excited about the SDE. As I said just to be sure check @SweViver Video, it’s explained very well. It depends on your room setup and where your LHs are located. If you tend you remount your LHs often then it will be annoying. But if you have a steady place for them it’s gonna be a one time setup. You basically need to adjust the XYZ once in order to have the controllers alligned to the right position. I took me 20 minutes the first time and 10 the second time. I’m not using it right now because I really do not like the vive wands, they simply lack of a thumb stick. I really hope btw that Pimax gonna consider the trackpad or thumbstick bull and do it right like WMR and new knuckles to have both. Yes it’s shame they choose the fixed ipd,maybe they took the basic hardware design that was already there, and produce it cheap? Sounds great about the oleds coming in fall,i’ll better wait for it or maybe there will be a good deal like with other wmr headsets. Yeah it really should be higher res. I went from the Lenovo to the 8k, the 8k it has roughly about the same pixeldensity. So there should be a big difference if they use two panels the same size like the lenovo. If not then the difference will be smaller like sjefdeklerk is saying. 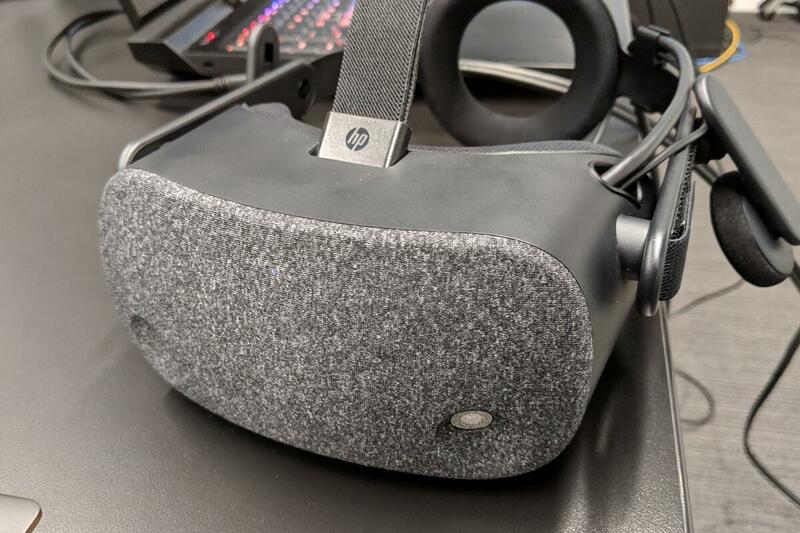 We go hands-on with HP's Reverb Consumer Edition, whose astounding resolution is well deserving of this exclamation mark! I’m getting realy hyped about this headset, end April is around the corner. Never seen vr365 so relaxed and his voice sounds very different. That’s textbook stoned right there while enjoying new tech like alice in wonderland, looking 10 years younger. Seems like they are having a great time. I went from the Lenovo to the 8k, the 8k it has roughly about the same pixeldensity. That is, you should not expect something outstanding in terms of the definition of SDE from 8K, if I currently use Lenovo Explorer? Don’t worry the resolution is a bit better on the 8k and the SDE is different. on the Lenovo its a bit fussy and the 8k more orderly diagonal. In most games it hardly is noticable anymore, for example in the lenovo i see the sde apparent in the sky in flightsims in the 8k i really have to do my best to see it. And in movies in bigscreen it is also very hardly noticable exept for in the subtitels. In ED the SDE is very noticable due to the bright text against the dark background.